Army Pfc. 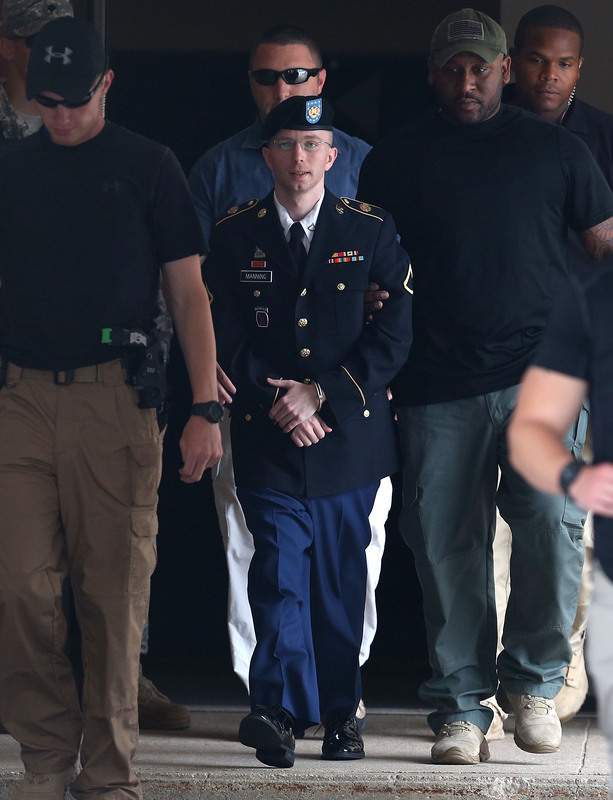 Bradley Manning was convicted Tuesday of leaking top-secret security information to WikiLeaks — but was also exonerated of his weightiest charge: "aiding the enemy." But his lawyers say they're not celebrating just yet. As the case moves into the sentencing phase, Manning and his legal team await the fallout for the 19 "guilty" counts. He could still face up to 136 years in prison for violating parts of the Espionage Act, depending what sentencer Army Col. Denise Lind decides, as new arguments are presented. As military law expert Philip Cave told NPR's The Two-Way, Lind has a good deal of discretion in the sentencing: "She can impose a punishment of no punishment all the way to maximum confinement," Cave said. Neither side of Manning's case were initially allowed to present evidence pertaining to the consequences of the leaks — i.e., no "The Taliban used this," or "Al-Qaeda didn't," rhetoric. Now, Lind will hear from both teams' lawyers on the question of damages to the U.S..